Of course, we first thought “What did I do wrong? Is it the battery? Is it… ?” You wondered what the bleep was going on! And while we saw fellow Fuji users complaining in forums about the same issue, there was no solution in sight. Not then… So I uploaded the images on my good old laptop where I still run an older version of Windows – and it worked. Perfectly so. Clearly, it was the Windows 10 update. All this happened to me in August 2015. That’s when I upgraded to Win10 . . . and as website and media designers, we know how important photos are on today’s web. The new OS of Windows10 has been released from Microsoft. We have confirmed that images in a camera cannot be transferred to a Windows10 PC via a USB cable because the camera doesn’t recognize OS information of Windows10. Note: This symptom happens only when a PC is connected to a camera via a USB cable. So, there is no problem when you use a memory card slot in the PC or a card reader. We will provide upgraded firmware for models with the symptom by posting the firmware on the Global website. With that said, they provide a time schedule for the release of upgraded firmware, and a list of applicable camera models – namely those launched as of 2010, including the X-E1. According to that schedule, the problem for the Fuji X-E1 will be resolved around year-end, i.e. December 2015. If you’re a happy owner of this fabulous camera model as well, keep an eye on the global Fuji site. Our frustration will have an end! Of course, if you have a memory card slot in your computer, or a card reader, your problem never occurred respectively can be solved fast. 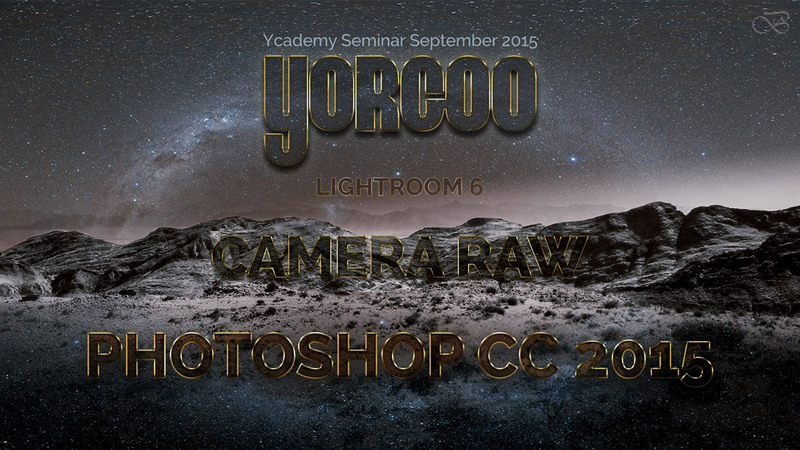 Today, high quality images and photos are even more important than ever before when it comes to website development and web design, this month’s Ycademy Seminar September 2015 will focus on the new features of one of the most brilliant programmes ever created in my view: Photoshop! Mind you, even if you have an older version – if you’re a skilled graphic artist who has an inner image of what the final product you create should look like – that’s fine, too. We’re talking of a tool, like a brush. It’s always a human being behind the tool who decides on the outcome. However, the more sophisticated the tool, the more we may be able to achieve within a shorter period of time. Don’t forget, resolutions are being pushed higher and higher, and streaming gets faster and faster – that’s the future market we serve. And that’s why we look at the latest version of Adobe Photoshop – CC 2015. If time permits, we’ll also look into Camera Raw – my personal favourite when it comes to improving a picture with a few quick tweaks. I hardly need anything else. If a picture isn’t up to standard, it lands in my waste bin anyway. But since I really started using my Fuji X E1 – especially during my time in Namibia – I’m just amazed at the difference in data compared to my good old Nikon Coolpix P90. In those days, my Coolpix was just perfect for what I needed on the Internet. With a very handy zoom, it allowed me to operate quickly and almost automatically, giving me in most cases the results I wanted (excluding low-light… duhhh!). But since I started to create printed books – with my first English novel “The Immortal Life of Piu Piu” coming out very soon – please join my Newsletter on my Author Website Here for updates and freebies – I quickly discovered my limitations. What I need now – besides much more experience, much more knowledge – is a 200 mm lens! Oh, they have even a better one, a killer lens I absolutely need for my next photo trip… back to Namibia! There’s nothing like home! By the way, the above photo was shot near Sossusvlei in Namibia in May 2015. It’s hard to imagine where we would be today without a programme like ADOBE Photoshop . . . and how we would cope without using layers! I still worked extensively with pencils, pens and airbrush in pre-digital times – and if for some reason the illustration was messed up – sometimes by a simple stupid thing like a sudden difference in pressure in my airbrush so that it would spit ink all over the design – well, that was game over and you didn’t want to have any dead lines in that moment! Yes, there’s progress! We’re living in a blessed time where we are able to explore, experiment and create at our heart’s desire – until we are satisfied with the result, the product – and our clients are happy, too! On a personal note: you may not have seen me blogging for a while… but this will change soon. This website will change as well… Just that the publishing of my book has priority right now and – believe me – I’ve been writing all the time :) Time for Google to remember that I exist!